The Effects of a Global Thermonuclear War, 4th ed. "U.S. should have missile defense system"
see also at The Brownsville Herald. President George W. Bush's Speech on National Missile Defense, 1 May 2001. CEA (French atomic energy agency) (English). Center for Nonproliferation Studies--at the Monterrey Institute for International Studies. High Energy Weapons Archive--in depth information, including some of the most detailed information on the Internet regarding nuclear weapon physics. Institute for Science and International Security. National Institute for Public Policy. Center for Arms Control, Energy and Environmental Studies--at the Moscow Institute of Physics and Technology. Centre for Defense and International Security Studies (CDISS)--in the United Kingdom. Jane's Information Group--publisher in the United Kingdom. British American Security Information Council (BASIC). 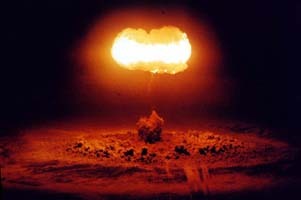 Banner image: Plumbbob Stokes, a 19 kt airburst test of the XW-30 conducted 7 August 1957 (credit: U.S. Department of Energy photograph). Copyright © 2001-2006, 2008 by Wm. Robert Johnston. All rights reserved.